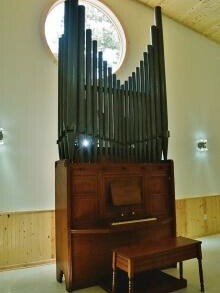 A gentleman named Baron was an English author that advocated pipe organs for all churches, even ones with limited floor space. 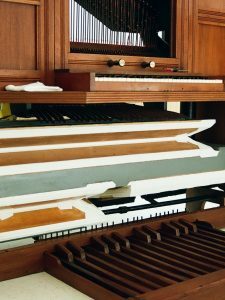 He produced a pamphlet on Pipe Organs for small parishes entitled, “Scudamore Organs, or Practical Hints respecting organs for village churches and small chancels, on approved principles” by the Rev. John Baron, M.A. Rector of Upton Scudamore, Wilts; (Wiltshire?) pub. 1858. 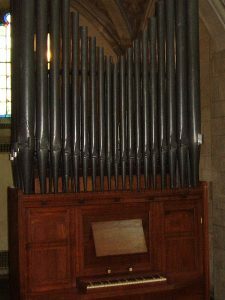 He was a Rector of the Parish of Upton Scudamore; hence, organs designed by English organ builders that fulfilled his requirements were referred to as “Scudamore” organs. This example was built by the Willis firm between 1857 and 1860. The Buzard firm was selected to restore the winding system before installation in the Blue Lake Fine Arts Camp instrument collection. This tracker instrument is still only playable by the hand pumping mechanism. 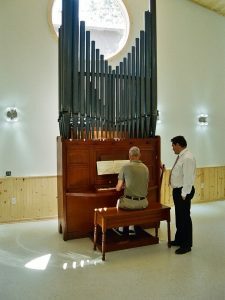 This organ received the Historic Organ Citation #402 from the Organ Historical Society. Its organ tone is incredibly lovely. The Buzard firm is proud to be the curators of all the organs in the Blue Lake collection.